As one of the premier law enforcement rounds in the country today, the .40 S&W was engineered from the ground up to perform. 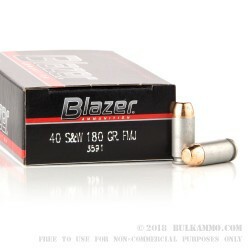 The Blazer 180 grain 40 S&W Full Metal Jacket is a round designed to bring out your full potential, and take your level of handgun proficiency further than you ever once thought possible. The 180 gr. flat nose round point bullets is one of the heaviest chamberings that the .40 cal comes in today. 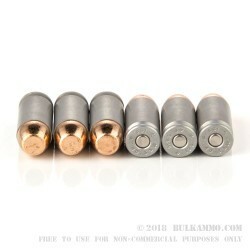 The solid copper full metal jacket mitigates bullet deformation upon impact with hard intermediary surfaces, and provides for a smooth aerodynamic profile with an inherently flat bullet trajectory. 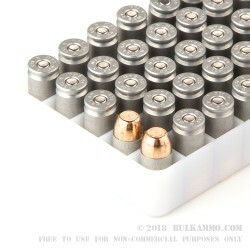 Pure brass cartridges prevent premature wear on your firearms internal components unlike steel cased and bi-metal jacketed ammunition, and are easily reloaded or recycled after firing to increase your return on investment after you are finished training at the range. 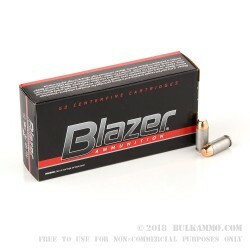 As one of the cleanest burning, hardest hitting rounds on the range today, the Blazer 180 grain 40 S&W FMJ is a great choice for shooters looking to stretch their dollars, without having to sacrifice on performance. A: Hi James, the velocity of this round is 1000 FPS at the muzzle, creating a 400 ft/lbs of energy. Great performance in a economical cartridge!